To pass your state and local licensing exams, you need knowledge and confidence. This comprehensive review guide gives you plenty of both. 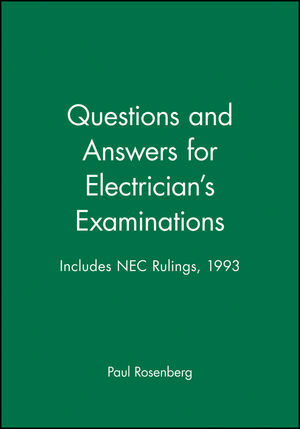 It's packed with sample questions to help you focus your efforts, review material on all aspects of the 1993 National Electrical Code (NEC), the lowdown on business competency requirements, and tips for studying and test-taking that will help you conquer anxiety ahead. Paul Rosenberg has an extensive background in the construction, data, electronic, HVAC and plumbing trades. He is a leading voice in the electrical industry with years of experience from an apprentice to a project manager. Paul has written for all of the leading electrical and low voltage industry magazines and has authored more than 50 books. In addition, he wrote the first standard for the installation of optical cables (ANSI-NEIS-301) and was awarded a patent for a power transmission module. Paul currently serves as contributing editor for Power Outlet Magazine, teaches at Iowa State University and works as a consultant and expert witness in legal cases. He speaks occasionally at industry events.